The volunteer is at the heart of British perceptions of the World War I. We are all familiar with images of young men leaving home, standing in long queues at recruiting stations, and being examined by Army doctors. Their naivety and cheerfulness speak of a now-vanished age of innocence, because we know of the ghastly horror that they would later confront. Typically, accounts of young men volunteering in 1914 are accompanied by a note to the effect that women too did their bit, by serving as nurses, as tram drivers, or as munition workers. But how many people know that of the volunteers who signed up in August and September 1914, it was women, not men, who were first out to the “war zone”? The King and Queen inspect the duchess’s hospital. With very few exceptions the thousands of young men who volunteered early in the war faced months, even years, of training, waiting for uniforms and weapons, before they went out to different fronts. Famously, many of the “Pals” battalions saw action first on July 1916 I, on the opening day of the Somme offensive. 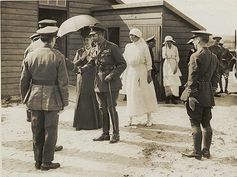 But women who volunteered as nurses, or “dressers” in August 1914 were in the war zone within weeks, and were involved in the earliest actions of the war. Some witnessed the most appalling scenes before medical services were equipped to deal with the consequences of modern warfare. Several wrote accounts of their experiences. Esmee Sartorius was one young woman with three months’ training as a nurse who volunteered on the first day of the war, and was sent three days later to Belgium with a medical team. By 14 August 1914, she, together with four other St. John Ambulance nurses of the Voluntary Aid Detachment, was in Brussels with a British Red Cross group. The small, professional British army being shipped out to France was still ten days from seeing action at Mons. Esmee’s group was one of 12 sent by the Red Cross to Belgium in these early days. They arrived to find complete chaos. The German army was marching through Belgium, using huge siege guns to overcome any opposition, pushing before them a human tide of refugees. The Red Cross teams were immediately caught up in the confusion. Some retreated to the Channel ports, and were evacuated, leaving their equipment behind them. The young Kate Finzi, elder sister of the composer Gerald Finzi, was one volunteer who had been taken on as a “dresser” on August 7 and sent to Belgium. She escaped from Ostend days before the Germans arrived. One whole group was overrun by the Germans, and eventually repatriated through Scandinavia, only arriving back in Britain shortly before Christmas. 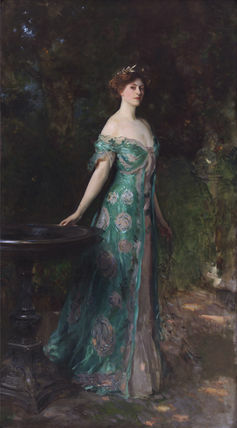 Before the war: Millicent, Duchess of Sutherland. Some of Esmee Sartorius’ group left before the Germans occupied Brussels on August 16, but she and other nurses stayed, to give what help they could. They made their way to a hospital full of wounded French soldiers near Charleroi, where they experienced “many exciting incidents and thrilling moments”. Using charm, bribery, and guile, Esmee and her fellow volunteers escaped to neutral Holland, and from there back to London. One of the first female volunteers in the war zone was the indomitable Millicent, Duchess of Sutherland, who quickly arranged for an ambulance unit bearing her name to be sent after her to Namur. This group too was overrun by the Germans, but cared for wounded Belgian soldiers before getting back to Britain through Holland. Faced with a ten kilometre walk at one point, the Duchess reassured her nurses, declaring: “one very nearly does that in a day’s golfing”. If these episodes, and the way they have been related, have something of jolly hockey sticks and girls’ adventure stories about them, we should not overlook the grim horrors these women faced while male volunteers were training back in Blighty. Kate Finzi was, typically, undaunted by the failure of her first expedition, and immediately arranged to be sent back out by the Red Cross. She arrived in Boulogne at the end of October 1914, and found there a scene from hell. Thousands of wounded men, British, French, Belgian, and German, were being transported from the battlefields around Ypres, and simply unloaded into empty sheds on the quayside. Here, unwashed, unfed, with suppurating, often gangrenous wounds, they languished, until army doctors and nurses, supported by Voluntary Aid Detachment workers like Finzi, brought order to the chaos. Why did so many young women volunteer? Undoubtedly they shared the patriotic sentiments which animated male volunteers. Many, like the young men who would become junior officers, had been to newly established boarding schools, and imbibed the voluntarist spirit extolled there. Toby Thacker is affiliated with the Labour Party.